Edit: So I keep getting emails reminding me that I forgot the cheese sauce. I didn't forget it, I simply used shredded cheese instead because it's what I had on hand. I've edited the recipe though to include the nacho cheese sauce for those who prefer it. So there are very few things that I love, like adore, when it comes to fast food places. In and Out Burgers are one even though I'll let you know that I'm kinda burned out on burgers right now and nothing seems appealing. Then there's Taco Bell and while I do enjoy a good Chalupa the Crunchwraps are my downfall. Man oh man, I love those. I just don't like having to leave my house when I feel like one, I also don't like spending the gas money, or waiting in the drive thru, or leaving the house to go get one....oh wait, I've said that already. I always find that if I can replicate something I really enjoy, it not only saves me time and money but I can also see what is going in to it and I can make it lower fat or pile on the cheese if I so wish. I was craving Crunchwraps the other day and hubby was at work and we only have the one vehicle, so going out was out of the question, so I sat here and thought about what all went into one of these and thought "it can't be that easy, I must be missing something?". Online I went and after a quick search I realized that I was right, there really is nothing special or out of this world to these...YAY! 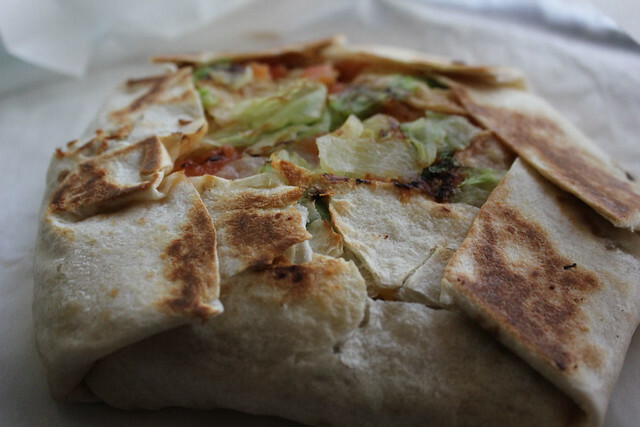 So all that babbling just to show you how to make some crunchwraps at home. Ha! 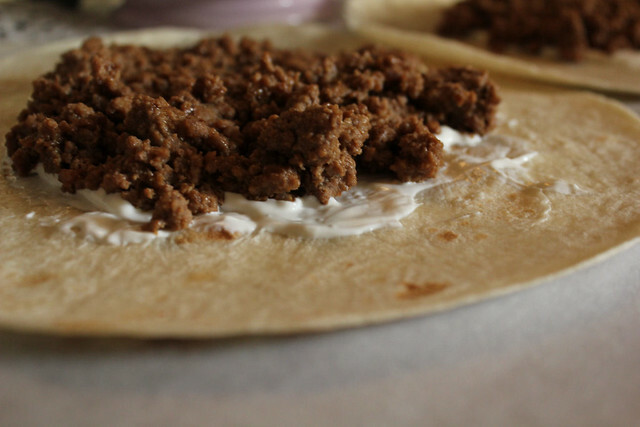 Brown ground beef in a skillet, add the packet of taco seasoning and stir until mixed well. Cook for another minute or so. Microwave the tortillas for a few seconds just to warm them up, it will make the wrapping easier. 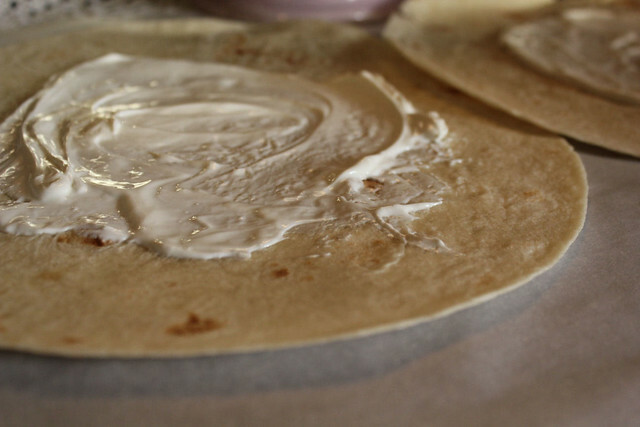 Take a tortilla, spread some sour cream in the center. Top with ground beef (1 lb ground beef made 4 crunchwraps, but they were nice and stuffed, you could probably get another 1 or two out of it if you don't use too much meat). Top with shredded cheese or a few scoops of nacho cheese. Next add a layer of tortilla chips or at this point you would add a small corn tortilla like a tostada size. 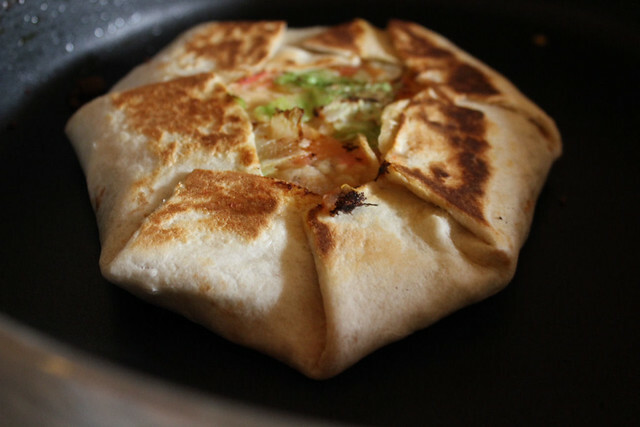 Top with lettuce and tomato and then starting on the bottom, fold up the tortilla toward the center, continue all the way around until it is all folded over, it WON'T cover it completely. Carefully lift it up and set it fold side down on a non stick pan. Press with a spatula and cook until nice and brown, flip it over and cook the other side. It won't take long at all. Oh my¡!!! These will be dinner next week. Thanks for an "easy" weeknite supper. Crunchwraps are my daughters favorite too. Thank you so much for sharing this--who knew it could be so easy!! My daughter thanks you too!!! Take care. So glad you posted this! Crunchwraps are my favorite too! Oh man...I've never thought of trying these at home. When I order them I always have them add Refried Beans and Extra Nacho Cheese. Maybe I'll try doing this some time since I'm trying to avoid fast food. I use my panini maker. Love it. I like to melt velteeta cheese in a pot with a little milk to get that creaminess!! Using the panini was a great idea! Not sure how you would flip these? But really good! What temp do you cook at? I just made these and thet were awesome! I didn't know they were so easy to make now im sure I will be making them a lot since hubby and the kid's love it too! uhhh....you forgot the most IMPORTANT ingredient!!!! The best part of the whole crunchwrap!!! NACHO CHEESE!!!!! You forgot the cheese sauce! I love Crunchwraps! I must try these. 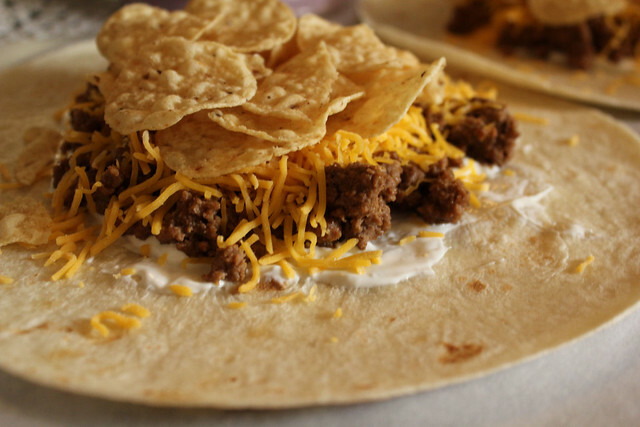 I think it would be fun to make little mini crunchwraps with medium sized tortillas. MMMMMMMMM, can't wait to make my own. They are my favorite thing at TACO BELL. Those, and the double decker taco supreme. you could put another smaller tortilla on the other side then fold the bottom over and then fry it. That way there would be no hole. 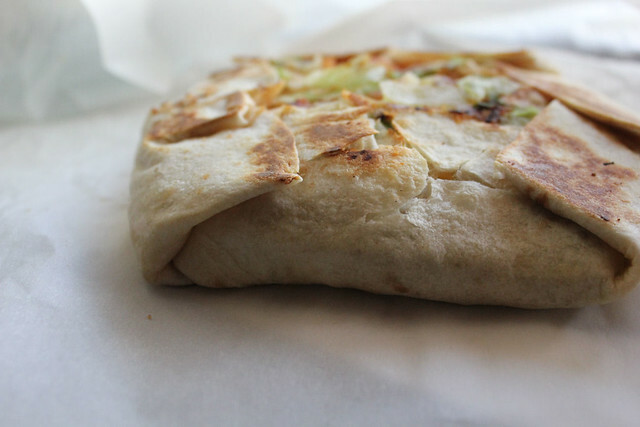 Make sure you butter the pan before you put the crunchwrap in so that the tortilla stays in position. Adding the lettuce and tomato after the grilling will prevent the vegetables from getting mushy and is easy to do by lifting the flaps and inserting. Finally, make sure to heat the tortilla before making. I know this was said before, but it makes a huge difference while wrapping. I made a vegetarian version of these for lunch today by using refried beans and Mexican rice in place of the ground beef. Topped with salsa after frying. 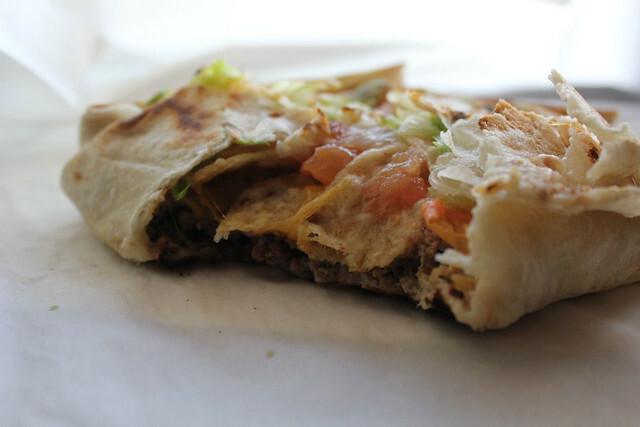 You gotta use the tortilla chips in there, love that crunch they add. These were great, filling and delicious! Thanks so much! That sounds yummy! Thanks for the suggestion! These look so yummy and I can't wait to try it. I shared your post on my blog this week. This is one of my favorites from Taco Bell, I am adding the ingredients to this weeks grocery list to make this week, looks so good! You're a genius. I was sitting here thinking how delicious that looks but super sad because I don't have ground beef on hand... I DO however have leftover chicken from last night's dinner. THANK YOU! 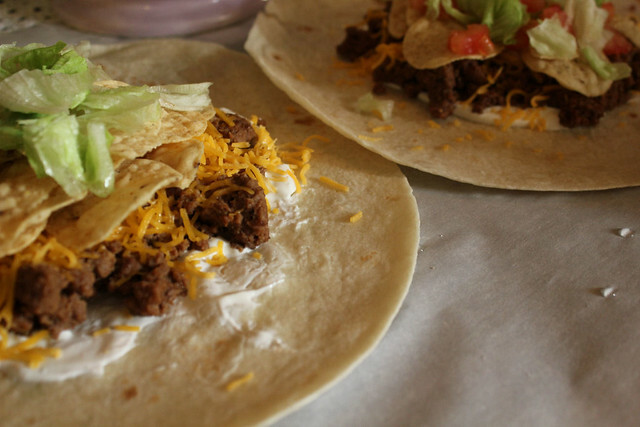 If you want to make it easier to wrap, use a crunchy tostada instead of tortilla chips. Just my opinion. Made this a month ago or so. Turned out really good! I wonder if I could make them using my Quesadilla Maker?? Yum!! So going to make these for today's BIG Basketball Game. Rock Chalk! !